Rejuvenate one's mind, body and soul at Savasana... this edgy and unique mountain home is anything but a cabin. With a Western Rockies flair and surrounded by glass, you will find it inspiring yet comfortable and cozy too. 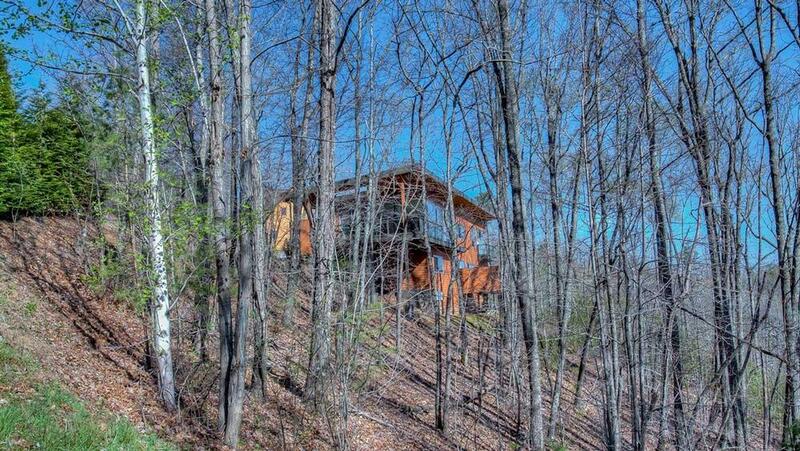 This modern mountain home sits in the Aska Adventure Area with paved roads all the way. As soon as you arrive, you'll feel as if you are one with nature in the hippest joint in town. Completely take in the outdoors as Savasana offers spectacular mountain vistas and distant morning sunrises over Lake Blue Ridge. This sleekly designed home was built with glass walls and glass deck rails to provide unobstructed views from every room. The three minimalist bedrooms offer exactly what you need in furnishings and all of the high-end comforts of a luxury vacation. Each room provides an uncluttered environment but offers reading light, vibrantly colored bedding and overstuffed blankets. 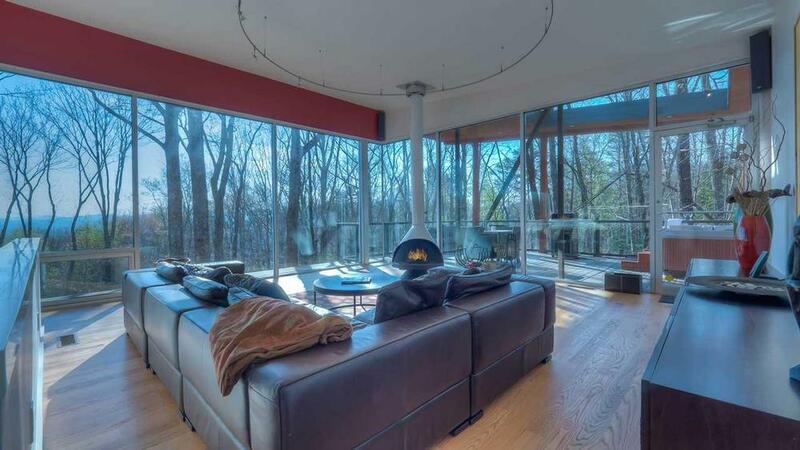 The large picture windows let you awake feeling part of the natural setting outdoors. The master bedroom is located on the main floor and features a queen bed, soaking tub overlooking the view and a walk-in tiled shower. 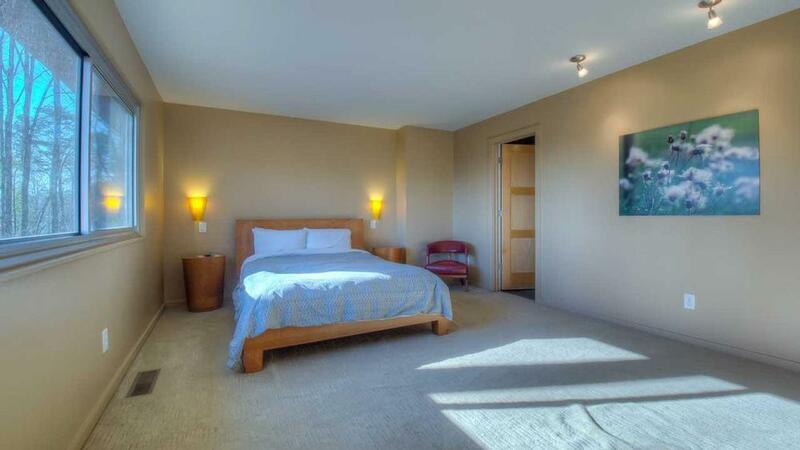 Step downstairs to find two other bedrooms, one offering two double beds and the other, a queen-size bed. 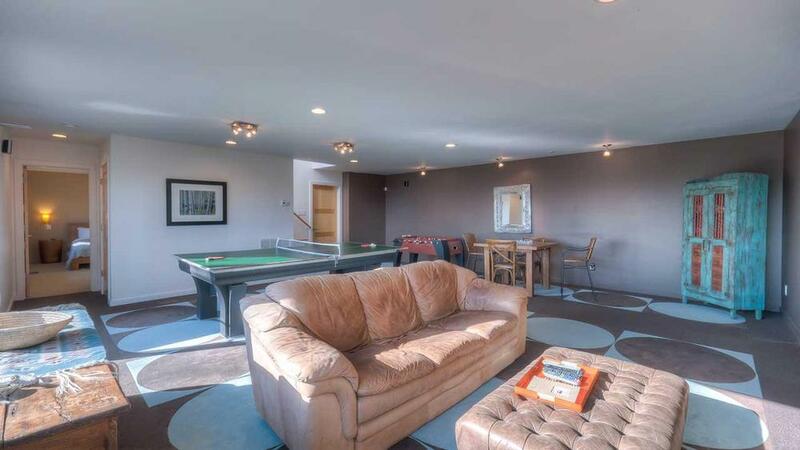 The downstairs floor plan is considered 'split' as each of the two bedrooms flank the game room on either side. The spectacular and fun game room has a card table, another seating area surrounding the large TV, and offers billiards and ping pong. Cooking and eating in this well stocked kitchen is something of a joy. 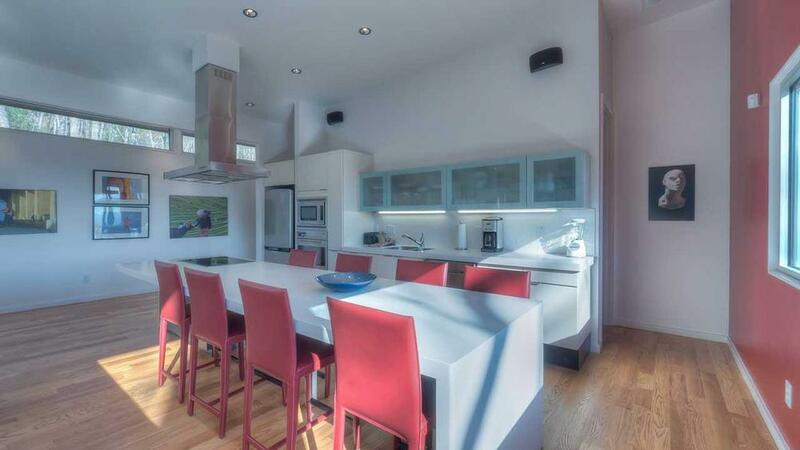 Savasana offers a large work space with convection cooking, plenty of cabinets and a table that seats eight. In Yoga, Savasana is an important pose that relaxes and invigorates your body and mind, and is known for relieving anxiety and calming the mind. In Blue Ridge, the Savasana home will do the same. Here, you will treasure and capture the special moments of your romantic getaway or two-family vacation. 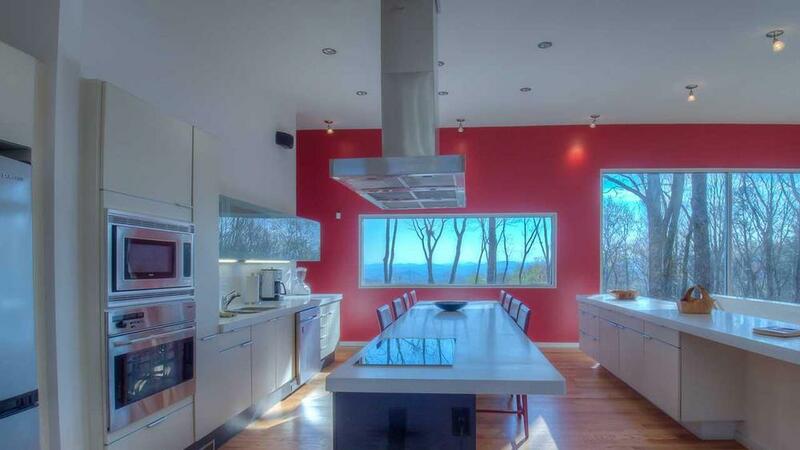 02/19 - The modern, large open windows and large open space was a refreshing take on a mountain vacation. The views from almost all rooms (due to the large windows) made it a great place to observe the mountains and nature. 01/19 - Loved all the windows and the hot tub and how minimal it was. You did a great job and we will definitely be using you again for our next stay. 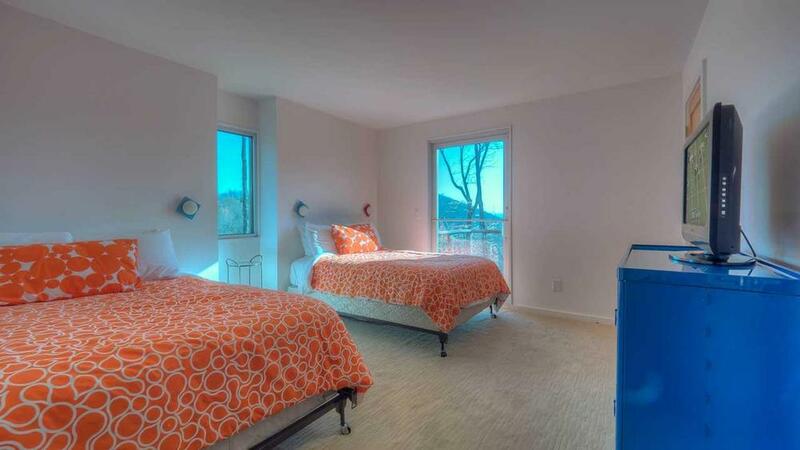 01/19 - Beautiful home with magnificent views of the mountains from every room and every angle. This is the second time we've rented through Escape to Blue Ridge and the service has always been amazing. All personnel are very cordial, professional and responsive. We will definitely rent from them in the future. 11/18 - Liked the location, design, amenities. Very good! We hope to rent the same place, same time next year! 10/18 - Modern home in a fabulous location. 10/18 - The modern design attracted us both right off the bat, the overall layout is wonderful. The open floor plan and amazing views were incredible. The highlight was the fireplace! Loved it!! The company itself was wonderful. Very friendly and accommodating. Great communication and helpful. 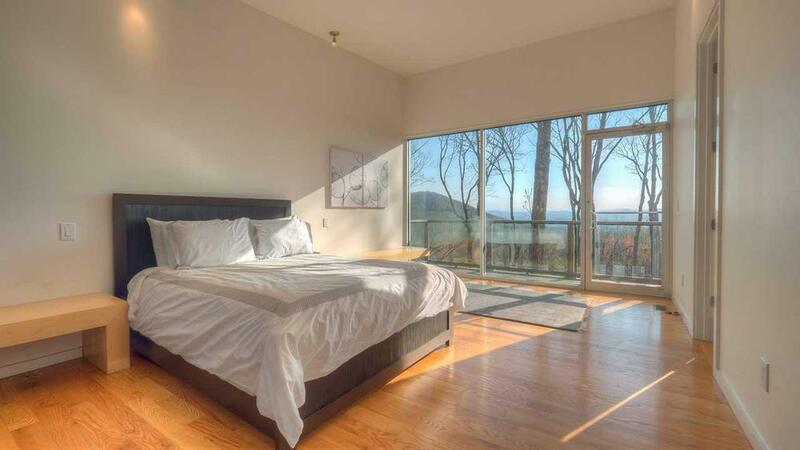 08/18 - Unbelievable view, architecturally and aesthetically unique, a chance to stay in a NY loft space in the middle of nature. 07/18 - We loved all the windows with gorgeous views! We will absolutely return to this home. The staff are very helpful and friendly. 06/18 - It felt like a tree house. We have always had good polite service. 05/18 - Everything we needed was available. The view was amazing. It's overall a beautiful home. The company was very helpful and provided great customer service thus far. 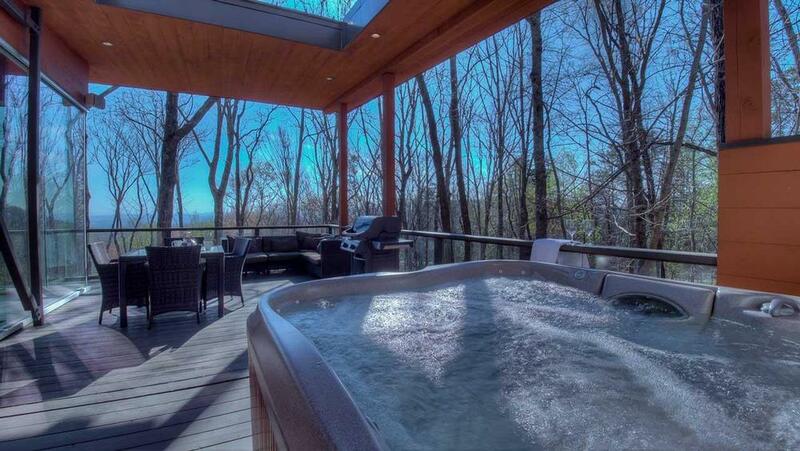 Loved the view, comforts, hot tub, fireplace, and location to downtown. Company was great. 3/18 - We liked the design of the cabin and enjoyed the fireplace. The staff are professional and efficient. 2/18 - I loved that the entire house had a view. I have been using Escape to Blue Ridge for years for my cabin getaways. I will continue using your company because my overall experience is always pleasant! 1/18 - The home and the company were great. 08/17- Loved the view and design of the house - very unique in Blue Ridge and takes full advantage of the surroundings. 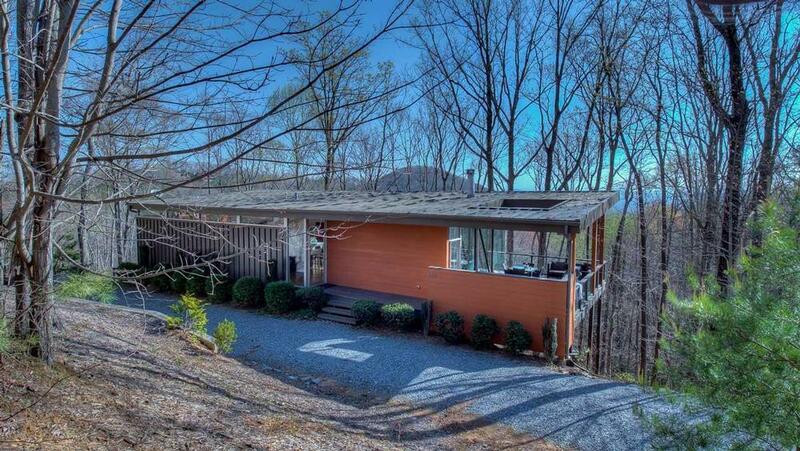 This house was also very convenient to downtown Blue Ridge. My experience is limited to this one transaction, but it all went very smoothly and was simple and efficient. I will very likely rent this same house again. 07/17- Savasana was wonderful. It came with all the amenities and features necessary to enjoy yourself and your family and friends. The company is first class! Mike was super helpful and the woman who helped in reservations displayed the most kind and genuine customer service I've encountered. 08/17- Not your typical cabin. Modern and spacious. Large glass windows. 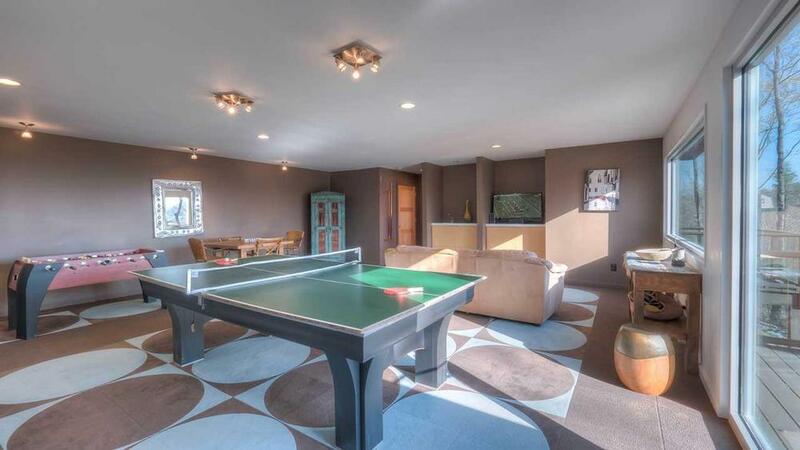 Nice game room. Excellent customer service. 06/17- Best cabin I've selected so far! The modern look was very nice and upbeat. I love the company, I mainly rent through this company for my cabin trips. 06/17- The cabin was exactly as pictured. It was beautiful, clean, open and airy. Beds were comfortable, linens soft and everything was wonderful. Loved the ping pong table! It was close to trails and town- we couldn't have asked for more! Wonderful interactions from start to finish. Quick response when we had an issue and helpful concierge when we needed input. 05/17- It was very modern, roomy, with excellent views. Excellent company. 03/17- This home is beautiful and a very refreshing change from the regular Blue Ridge homes covered in antlers and bark. 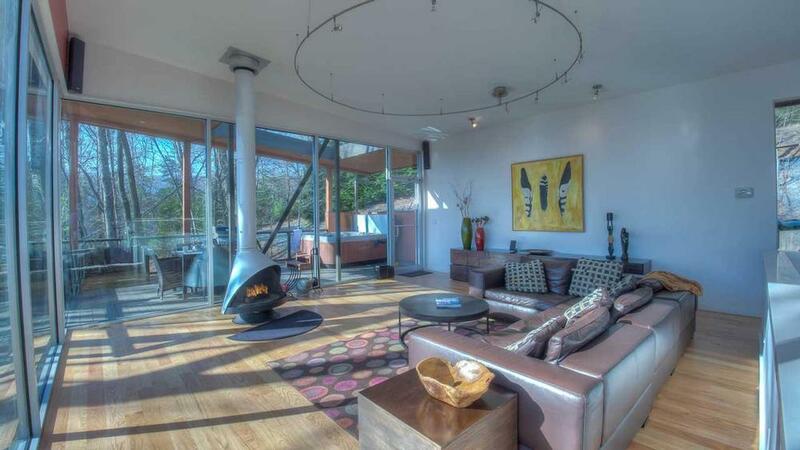 This home is SUPER modern with floor to ceiling or BIG windows all over the home. The views here are fantastic and stunning from every room! The hot tub was nice and big but did feel like it had been shocked a bit too much. The furniture was very comfortable and the bedding was VERY comfy. The towels were also very nice. Getting to the home is fantastic since the road to/from the home is totally paved and very easy to get to which is a rarity in the area. Escape to Blue Ridge was fantastic about being in contact. They were easy to reach with questions and super friendly. They are also very good about calling you back as they said they would. 03/17- This is probably the most beautiful place my husband and I have ever stayed! The view is absolutely breathtaking. The staff were extremely nice and made booking our stay simple. 03/17- We enjoyed the modern style and the views from all rooms. Great customer service. 02/17- Savasana is a beautiful contemporary cabin in a great location. Escape to Blue Ridge does a great job. 01/17- The home itself was very nice. I loved the views that were afforded with the huge glass windows. I had a very pleasant experience with the company. 11/16- Beautiful location and view, especially the morning sunrises! Close to town, but doesn't feel like it.. The house is an architectural joy, lots of windows make it feel as if you're in a tree house, and the split bedroom downstairs is a great design idea. The kitchen is amazing and fairly well stocked! The firewood bin was well loaded and we really enjoyed the fireplace. The linens and towels were plentiful and clean. Lots of pluses with this home. Lots of games and the pool, ping pong, and foosball tables were a great deal of fun. Hoping to return soon! 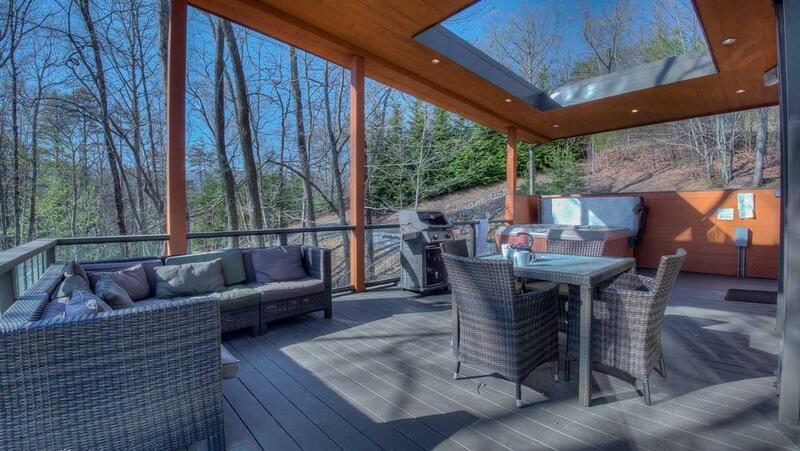 11/16- We loved everything.....this home goes beyond with the amenities, decor, comfort and views! Love the contemporary style. Very professional staff and quick responses! 11/16- Love the view from every room. You have a fine organization and we will definitely rent through you again. 10/16- The views were incredible - very spacious cabin with great amenities. I was very pleased to find a pet friendly cabin. We love our dog and he goes everywhere with us. Nice to have options to take one of our family members along! 09/16- Fantastic views. Very professional company. 08/16- The view and the impression you were up in the trees. The open space you feel. 08/16- The views are fantastic from this home from any room. I also like the updated decor. Very artsy and the place has a nice vibe. I liked the security system and the lighting inside and out also made the place look inviting and warm. Good company with friendly customer service. 03/16- None. Very disappointed. See below. 02/16- I loved the architect of the home, I loved the windows with NO blinds, I loved the living rooms, kitchen area........I loved the PAVED road leading up to the house. It was an AWESOME house/cabin. This was the first time I used this company to book a cabin, I usually use another web site for the same area. However, this company was great to work with, the follow-up email, then the phone call to confirm. along with the follow-up emails, the company was on point with all aspects of the reservation and follow-up. 12/15- How different it is from any other cabin we have ever stayed in. We would both love to have a place like Savasana to live in! Just beautiful. This was a great trip, and your staff was very helpful when we needed them. A great place, and we had a great time. Thank you! 11/15- It was such a nice experience. It superceded my expectations. More friends want to visit but I don't want to share..lol All the views, fully equipped, very accommodating..
11/15- Sleek modern design. Massive window walls maximize view. Location. Beautiful minimalist decor. Love it because it is NOT "homespun in the country". 10/15- The decor and amenities were amazing! Excellent service! 08/15- The beautiful glass windows from floor to ceiling and how clean it was. Great company very patient and accommodating..
08/15- Savasana was an oasis of aesthetic beauty from the moment we entered the home until we left. We loved the way in which the home was built to enjoy the view, in how the home was painted (the walls were somehow comforting to me as I walked room to room), and how it was decorated. As usual, straight forward and easy to work with. The site is easy to navigate and find the rentals that work for our family. Looking forward to the next time we use your services. 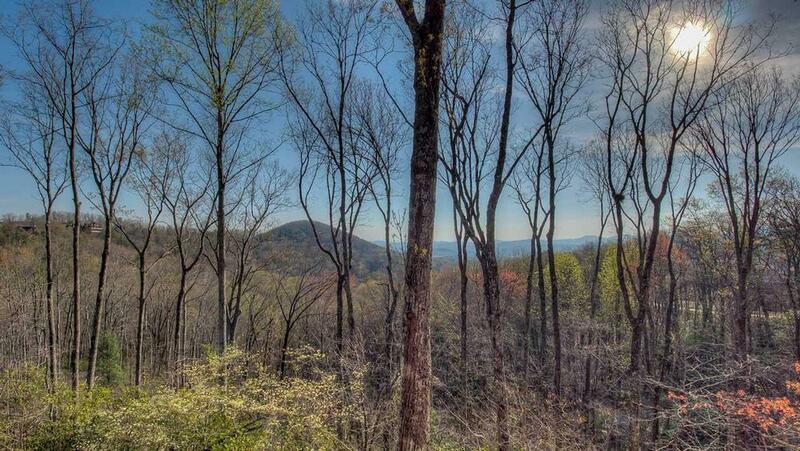 07/15- The view was wonderful.We have stayed in a Blue Ridge Cabin for 3 years. We have always enjoyed working with you. 08/15- The views are incredible. We like that it is modern house. The location is convenient to the Town of Blue Ridge and other activities around the area. We are pleased with the service we receive when we book the cabin and the when we have a problem while staying at the cabin (this year it was the air conditioning) somebody came out to fix it the same day. 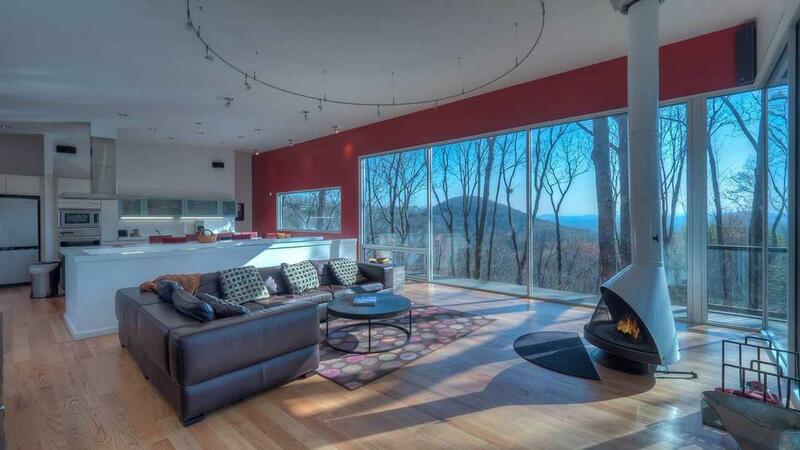 06/15- Beautiful modern home with gorgeous views of mountains, trees and birds. Comfortable beds. 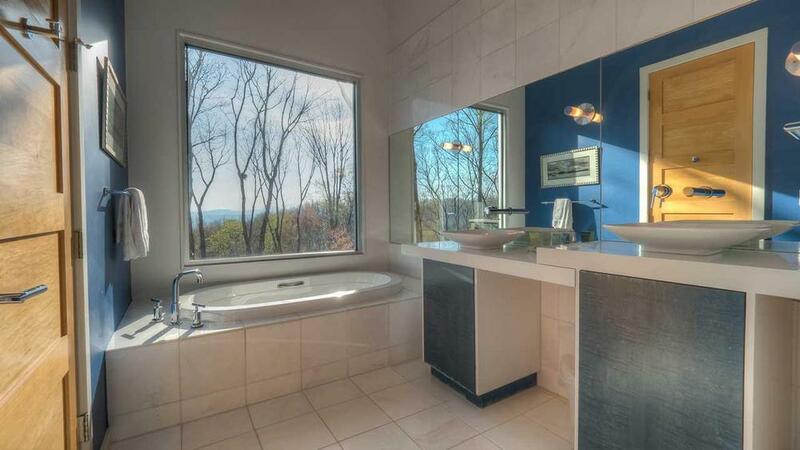 Nice kitchen great bath tub. Glad to have had a washer and dryer and diswasher. The weekends were particularly peaceful when there was no construction going on. We loved the house but had to spend weekdays out all day because of the noise so close. We liked that the location was very close to town and nature trails. 03/15- The view is amazing. 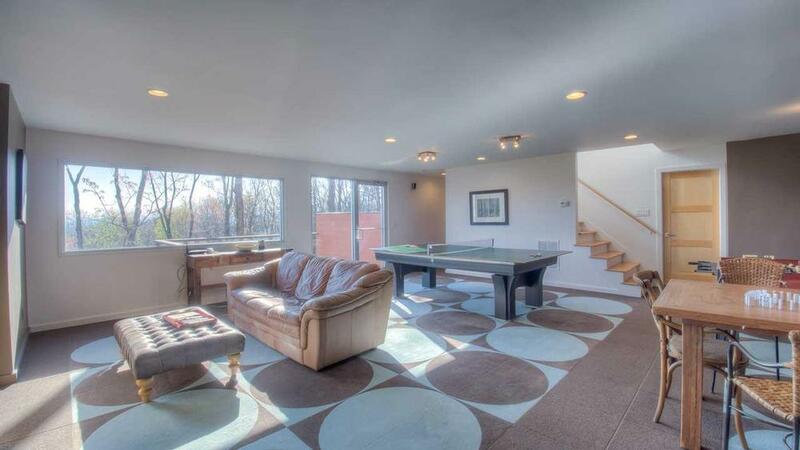 Love the open floor plan on the main level. I really appreciated the well stocked supply of wood - that came in handy with all of the snow. Grill and hot tub were also very nice. Great experience. Very professional. Would use you again without hesitation. 02/15- The kitchen. The whole house was beautiful. 01/15- Loved the open design and the views. 01/15- The glass walls in the main room and throughout the house were beautiful. 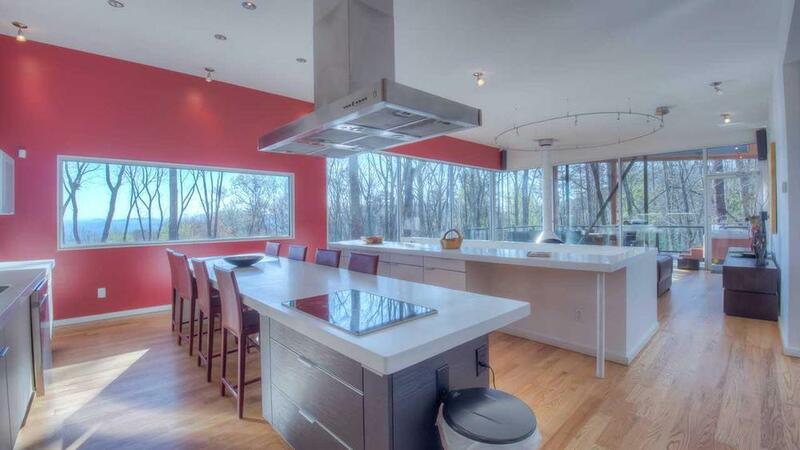 The kitchen and entire upper floor modern design is very nice. 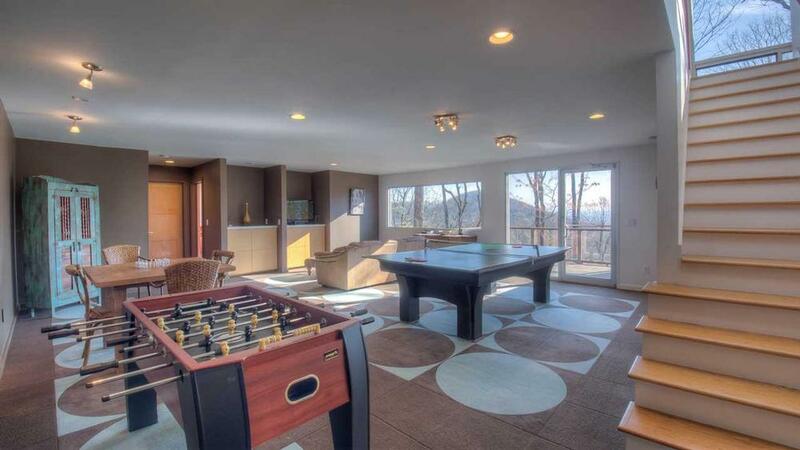 Loved the game area down stairs - we used the ping pong and foosball for many hours, especially with the dreary weather. We really just liked the upscale clean modern design of the home and open spaces. 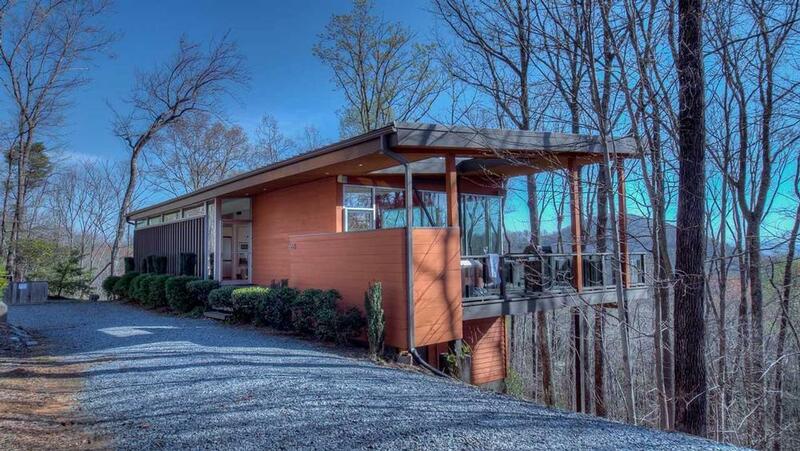 11/14- My family and I loved the modernism of this home. 10/14- the windows, location, and the view were our favorite features. 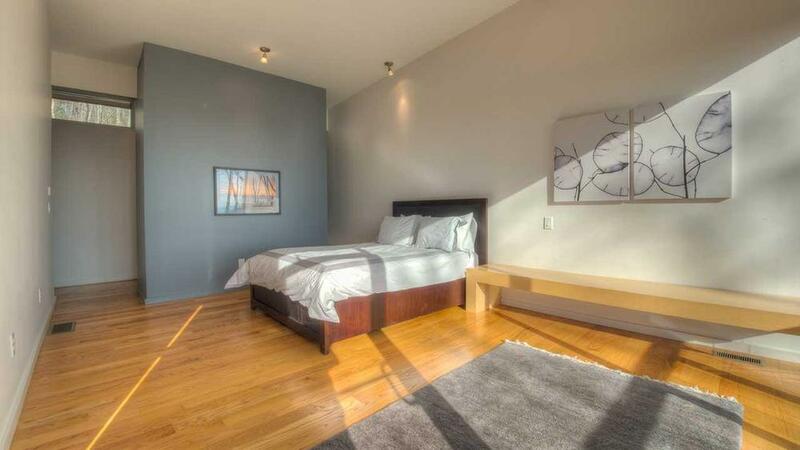 10/14- Slick modern design, location (high up, isolated, but convenient to downtown), view, amenities. Most of all, the fact that it WASN'T another generic log cabin. 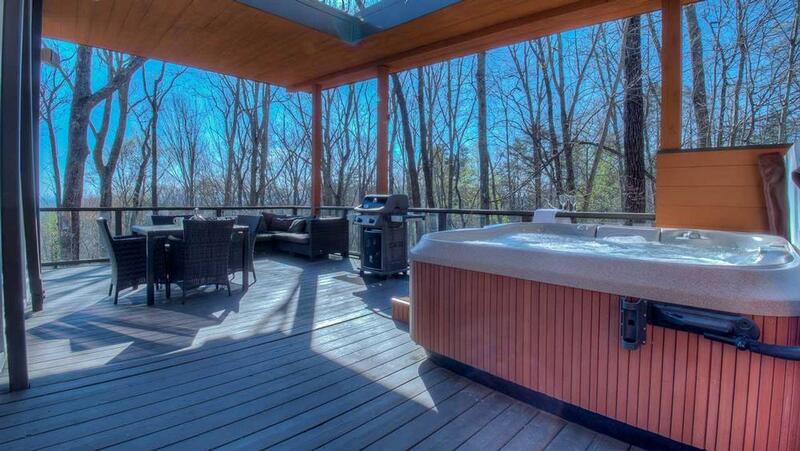 09/14- Loved the fantastic views, the great outdoor seating area with the hottub and grill, and the spacious kitchen. 08/14- Modern minimal design and spectacular view. 07/14- The view as amazing. Our stay was wonderful. The cabin was clean, well supplied, and provided the perfect get-away to relax and recharge. The staff as Escape to Blue Ridge were friendly and very helpful. Their directions were clear, and made the process flow seamlessly.